It was the best of times, it was the worst... no wait, it actually was the best of times in terms of sewing. This week I have been working to draft up a couple of properly fitting top patterns for woven fabric. 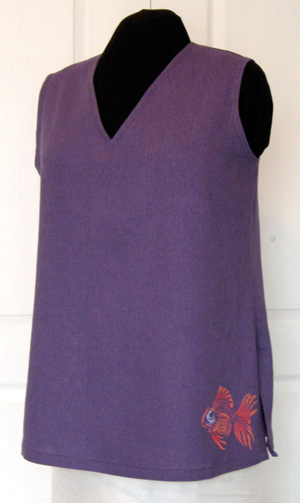 The first one I did is a hip length tank with darts and neckline options and the second is a long tunic with slightly dropped shoulders, boat neck and deep side slits. I selected a grape coloured cotton linen blend from the recently reorganized stash for the muslins. Mostly I chose it because it was the right weight and I had a lot of it, likely 3 metres or more. And I remember paying very little for it at an end of season sale last year - or the year before! I figured I'd get two muslins and maybe one finished top out of it and wasting some of the fabric would not break my heart. Surprisingly (to me at least) I must have done a pretty good job on the pattern drafting because both the muslins were about 90% successful right off the sewing machine! 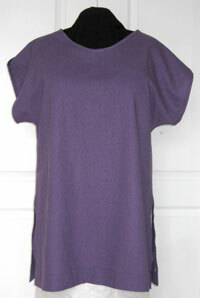 The tank top just needed the arm holes cut a bit deeper - easy to do on the partially constructed garment. 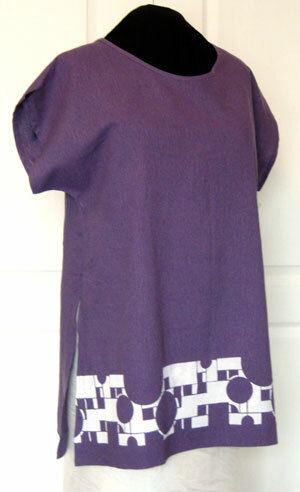 The tunic could have used deeper armholes too, but you can't cut into empty space! I made the change to the pattern for next time, but the rest of the sample was so good I didn't want to just trash it. So I added slits to the shoulder seam to give the arm area a bit more room. It's not bad. With these changes making the tops fit well, it was worth putting in the time to do the facings/bindings and hems. Hmm. 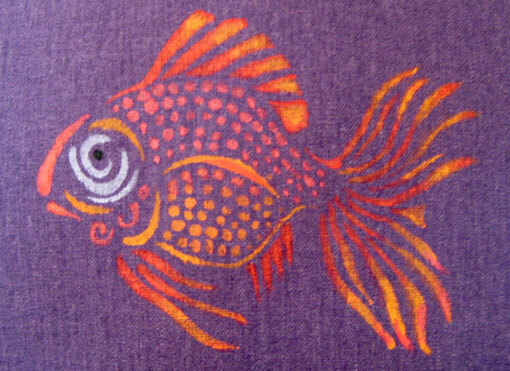 Now I had 2 plain purple linen tops. And I didn't even know I needed one! Here was an embellishment opportunity it I ever saw one. I decided to use a couple of stencils that I have been hanging on to for a while. 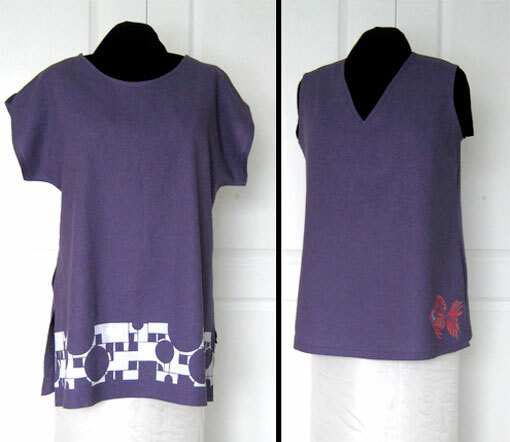 I've made this pattern so that the back and the front are the same, so I continued the theme with the stencilling - essentially this is a reversible top. I can wear it plain side forward with any long jacket covering the design on the back or design forward with white pants or skirt. Crisp! I'm a bit bustier than my mannequin here and I actually have arms, so I have to admit that it looks slightly better on her than on me. Deeper armholes next time will make all the difference. The stencil for this is one of a number of Frank Lloyd Wright designs than Mark and I picked up at the gift shop at Taliesin West in Phoenix several years ago. I used a spray-on temporary adhesive on the back of the stencil so it laid flat and a small foam roller for even coverage in the large cut out areas. The edges came out clear and sharp, but I had to touch up a few spots into the white areas where the fabric paint was a bit thinner. I did this with a fairly dry brush. This is very summery top, so I thought I'd do something with some hot colours. The stencil here is one I've had for years but never used. 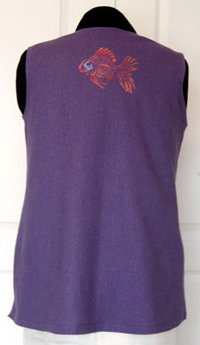 Having stencilled the front of the first top, I decided to do the back of this one. Small brushes were the tool for this job - working the paint well into the tiny details and then adding some additional shading afterwards. Painting the fish was so much fun and it looked so good when I was done that I did it all over again on the lower front. Then I made myself stop. I think this design could easily have some embroidery and or beading added. I'm still thinking about that. So, it was a successful week in sewing. The only problem is that it is still firmly winter here! Will it ever be linen weather again? In winter, summer is only a myth.